Some of my favorite items in the whole collection are vintage Nascar tickets, programs, and brochures from the 1950's through the 1960's. I also collect media credentials, garage and pit passes, media passes, and other misc items. Pole day tickets, made by most of the tracks, are nice collectables too . Nascar Ticket Image Gallery - You are on page 3. Here is a look into the history of Nascar with images of vintage and new tickets, brochures, and passes. 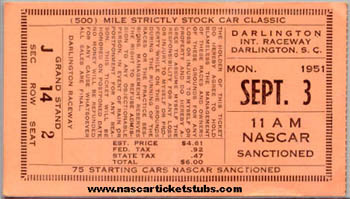 1951 Darlington Southern 500 ticket. This is a ticket to just the 2nd annual Southern 500. Herb Thomas won this race for his 3rd career victory. 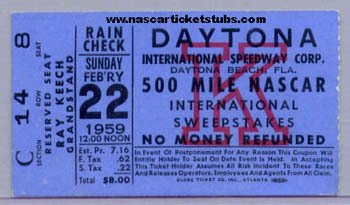 1959 Daytona 500 ticket. The first annual Great American Race. This is a ticket to the very 1st Daytona 500. Lee Petty won this race for his 37th career victory. 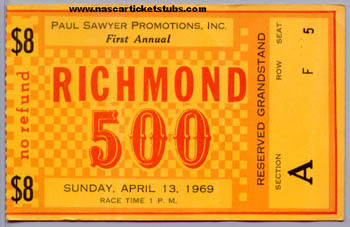 1969 Richmond 500 ticket. This was the 1st annual 500 mile race at Richmond. David Pearson won this event for his milestone 50th career victory. 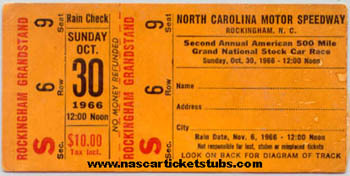 1966 Rockingham American 500 ticket. This is a ticket to the 2nd annual American 500 at North Carolina Motor Speedway. Fred Lorenzen won this race for his 25th career victory. 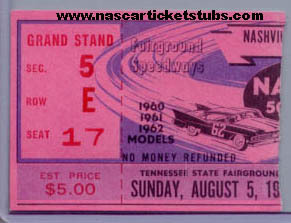 1962 Nashville 500 ticket. This is a ticket to 4th annual Nashville 500. This race was won by Jim Paschal for his 12th career victory. Thanks for viewing these 5 pictures. Click on the links below to view even more! I'm always adding more and will eventually have pictures of every ticket. If you have questions or comments, please don't hesitate to email me! If you have any tickets that you would like to donate or even sell then email me because I'm always accepting or buying.